You know, life is always interesting in Fort Mac, and this week has been particularly interesting for me personally. It began with a kerfuffle on Twitter that somehow involved me, the incorporation of a new word into my vocabulary (pocket retweet), and ended with an apology - and some thoughts on mistakes. I received a phone call yesterday from the city councillor that I wrote about on Wednesday. I had debated long and hard over blogging about that original incident, as it was clearly an event of the "tempest in a teapot" kind, but it had happened in my teapot, and I'd been caught in the storm, too. I had been quite angry and disappointed over this incident, but I try to be a reasonable person, and I don't believe in carrying grudges. I think they are harmful, both personally and professionally, and so when some of the councillor's friends approached me to ask if he could call me of I said yes, of course. Apologies take courage, people. Sincere, genuine regret is truly rare, but I feel I saw that yesterday. An error in judgement occurred. It was compounded with a "pocket retweet" joke gone wrong. The words on a social media forum carried far more weight and had more impact than had been expected. And, in the end, there were lessons learned. You see, I believe we are ALL responsible for what we say and do - whether we are city councillors or bloggers. I know that some day I will make an error in judgement, and I actually hope that if I do I am called on it. I hope that those who point it out to me will give me a chance to apologize and rectify it, but even if they don't I know I will learn from the experience. It might be uncomfortable, it might be embarrassing, and it might even be a little painful - but growth can be all that. In the end, though, if you walk away with a lesson learned it's worth it all. I consider the pocket retweet matter over. I accepted the apology offered, and I hope I helped the city councillor (who seems like a nice man, and who I have always respected prior to this incident) feel better about it, too. I don't enjoy making people feel badly, but I will hold them accountable for their actions and words, particularly when they affect me. I recognize, though, that we all make mistakes. This week it was the turn of a city councillor - next week it might be mine. I hope that when my turn comes that I am able to show the genuine contrition I was shown. 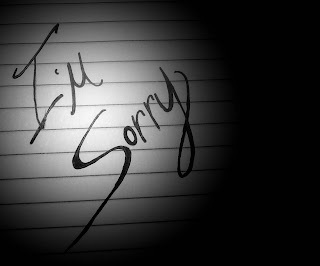 I hope that when my turn comes that I can take that deep breath, pick up that phone, and say "I'm truly sorry". For that, people, takes strength of character and courage - and I hope I have those qualities in the same measure as the councillor who expressed his sincere regret to me. It truly reads like you're afraid to release this person's name. Why? Are you protecting them or yourself?